Apart from catching up on some recording and finds processing we decided to move away from Hanwell for a spell and concentrate through November on getting practical activities underway at Enstone. 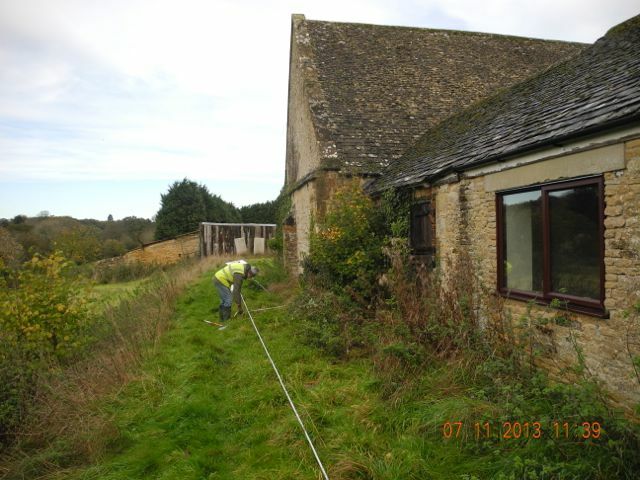 Our initial focus was on the land around the fine medieval tithe barn which was formerly part of Rectory Farm. 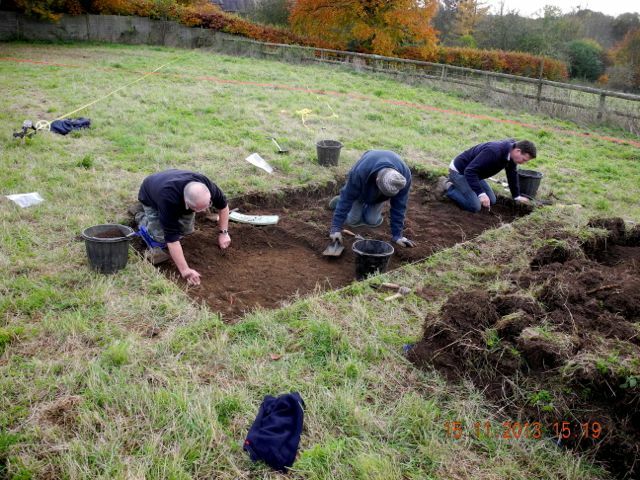 This was of interest on account of the terraced slopes to the west which had already been identified as the possible remains of a seventeenth-century garden. 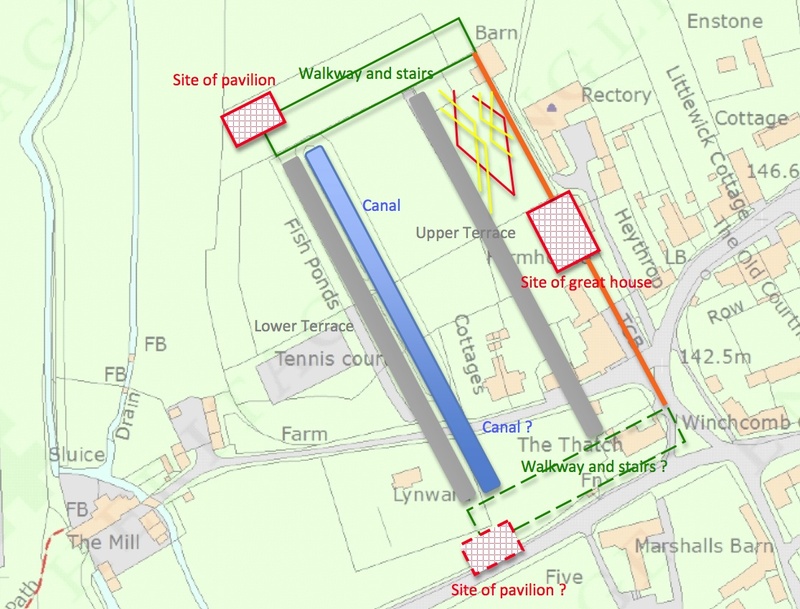 A further relevant point was the suggestion that the adjacent property, Rectory Farm was on the site of a great house of the seventeenth century to which the gardens presumably belonged and which may have been leased by Thomas Bushell during the development of the Enstone Marvels. My suspicion is that the Marvels with the superimposed banqueting house was part and parcel of a designed landscape which included the gardens surrounding the house, well that's one of my initial ideas. 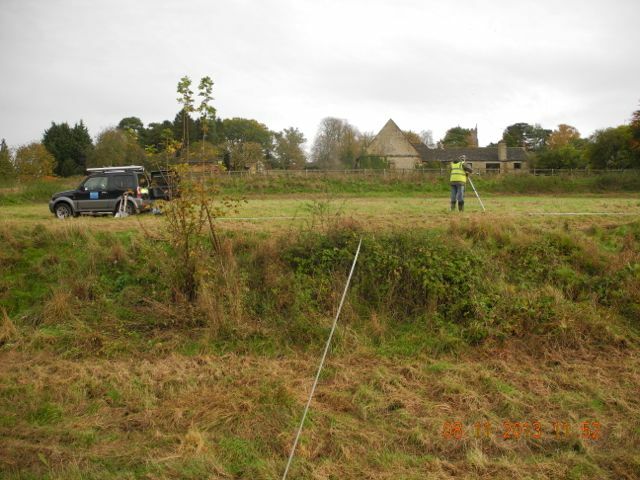 The first step was to undertake a detailed survey of the extant earthworks. A couple of days work took us from the first terrace to the west of the barn down to the second terrace and then the extraordinarily elongated fishpond or canal further downslope. Special thanks to Robin for lending a helping hand with this. 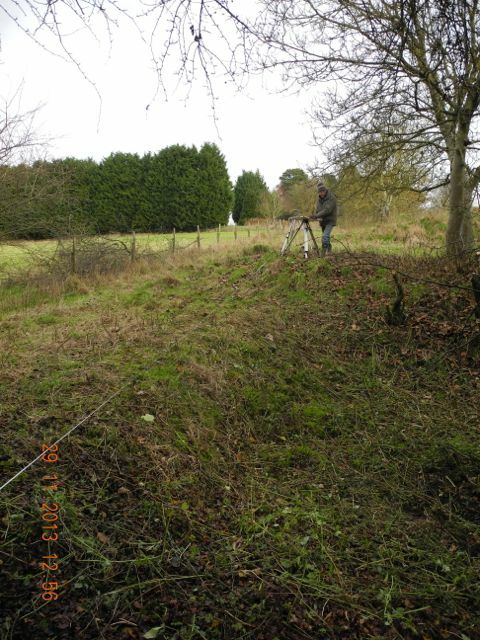 It became clear fairly rapidly that the upper terrace was in fact a collapsed revetment wall. Further wondering round revealed extensive and hitherto unrecorded garden earthworks to the north including the potential site of a grand staircase leading down the valley side. 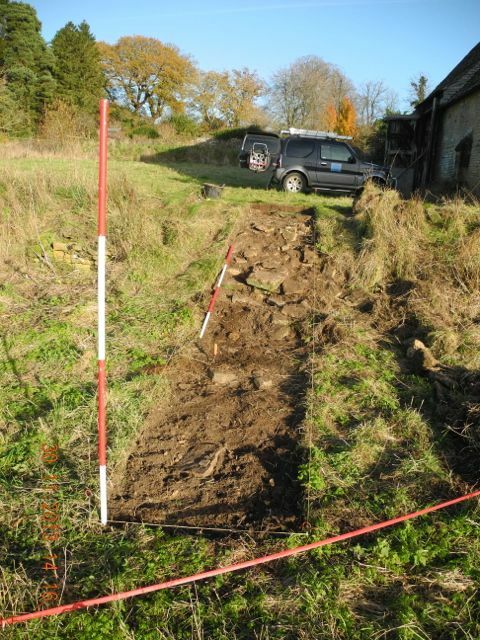 Detailed recording on the ground below the canal showed traces of a further ramp or possibly steps heading towards the valley bottom. 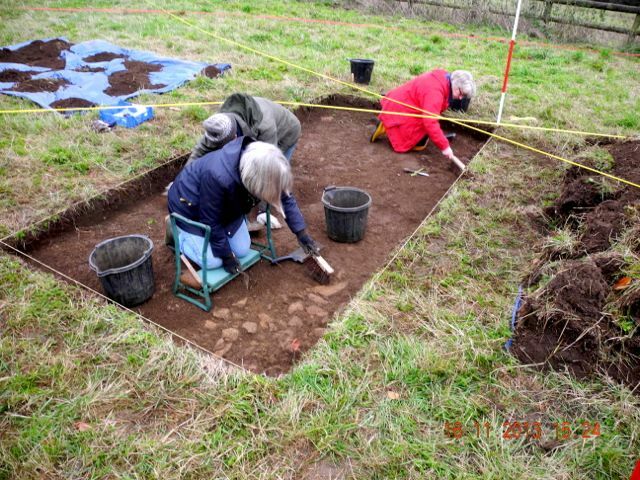 Beyond the lower end of the stairway are further earthworks including a rectangular terrace and an oblong sunken area which may be a small pond but looks rather more like a partially filled cellar! The first base-line goes down next to the barn. Part of the revetment wall peeking out from the undergrowth and a ramp that terminates the north end. Measuring across the canal. 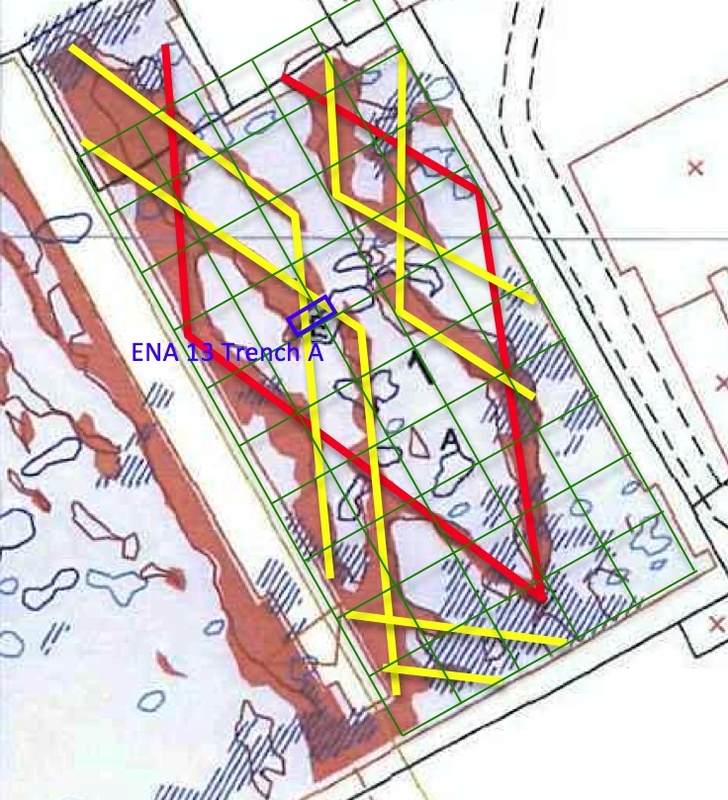 Geophysics plot by Bartlett-Clark Consultancy overlaid with possible layout of parterre. 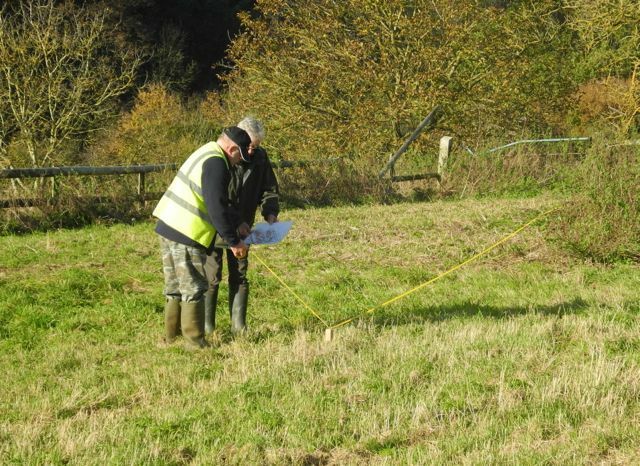 During the week that followed I spent some time studying the remarkable results of the geophysics survey commissioned by the landowner. This clearly identified on the upper terrace a lozenge shaped pattern which surely must reflect surviving features from the early garden layout. Parterres with a diamond based motif are unusual but not unknown in the seventeenth century and although a number of different interpretations are possible I opted for one with a large central diamond partially intersected from each side by a pair of overlapping chevrons. Given the strength of the signals we felt it would be productive to mark these out on the ground for further investigation. We did this with a series of wooden pegs hammered in at measured locations and then joined together with lengths of plastic survey tape. It looked most impressive and being able to walk amidst the pattern gave a great feel for the scale of the whole thing. Consultation over the master plan. The last line goes down. The Upper Terrace, south end looking south west... north end looking north west. 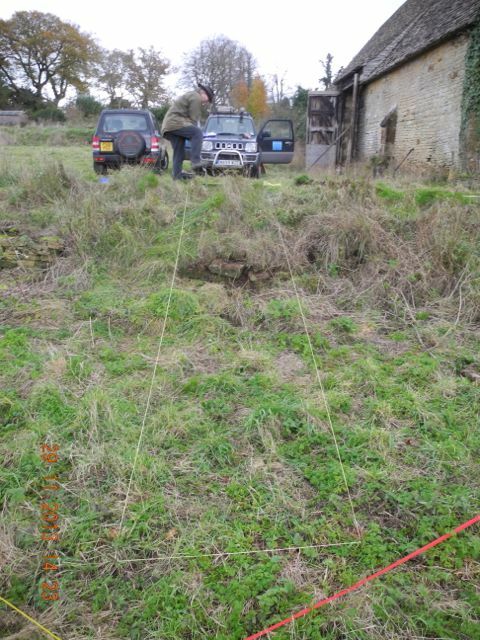 The results of this exercise were so striking we decided to move on directly to a 2 by 4 metre evaluation trench to determine the nature of the underlying deposits and to assess their depth and levels of preservation. Removal of turf and topsoil to a depth of just 20 centimetres brought us down onto to surfaces composed of irregular but level small stone slabs. These cut across the northern corners of the trench pretty well on the lines indicated by the geophysics. Sally, Robin and Harriet keep up the good work cleaning up on the following day.... how's that for an alignment? During my explorations of the site I came across the two architectural fragments pictured below sitting on the overgrown step of the patio door belonging to the now deserted bungalow adjacent to the barn. 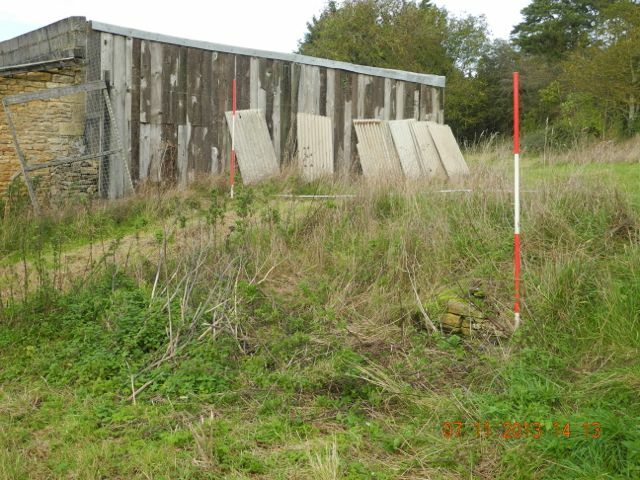 These had been recovered by the landowner from another location closer to the barn and are clearly sections of window mullions. 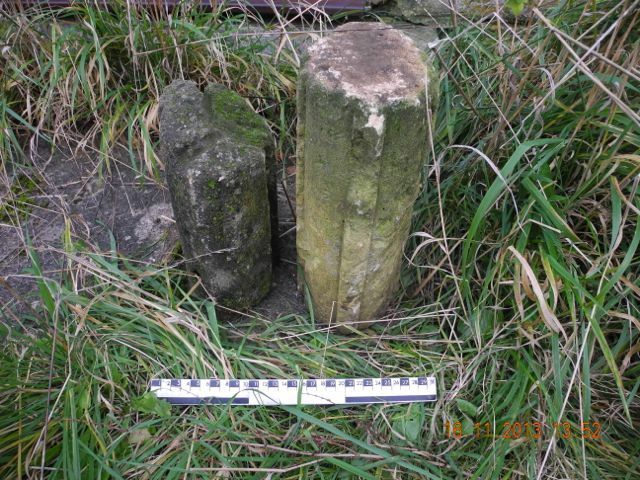 What is interesting about them is that whilst both seem to belong to a fairly major construction of the seventeenth century they are in two different types of stone and are stylistically quite distinct, one being broadly octagonal in section the other being ovoid with attached rectangular section fillets. So not only to we have evidence for a fairly impressive building of the period close to the site but one that may have been remodeled or extended twice during the seventeenth century. Events of the first few days set me to thinking about the overall layout of these gardens and to making some big assumptions so here we go. Let's start with the premise that the current Rectory Farm House was the location of a slightly larger great house of the seventeenth century which in turn occupied the site of an earlier medieval house associated with the Abbey of Winchcombe and the marvelous tithe barn. We'll look at the evidence for this in due course but just bear with me for now. The existing garden remains are strikingly asymmetric with the terraces and canal running roughly north to south and the garden bounded on its northern limit by our grand stairway. Now there's evidence that the canal at least extended much further south but exactly how far? Today it stops against the narrow lane that runs down to the mill but what happens if we assume the house stood at a mid-point in the garden which was symmetrical about it. It is an easy matter to project to the south of the house an equal area of garden and bound it further to the south with a second monumental stairway. What's interesting about this is that it brings us precisely in line with the current main road through the village indeed it's striking the way in which the parallel lane down from the church bends round to the south as if to avoid passing through the garden. 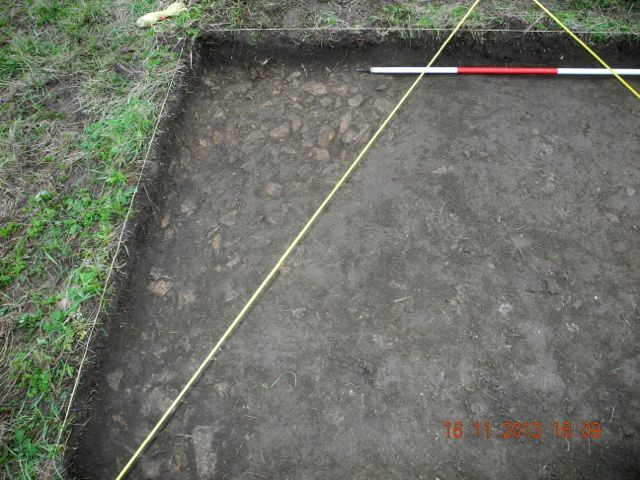 What is more telling is that there is some evidence for a terraced ramp in the field adjacent to the main road. Not as well defined as that to the north but certainly something worth investigating. So there you are not even a theory yet, a conjecture perhaps, but certainly something to think about and perhaps use to inform future research. 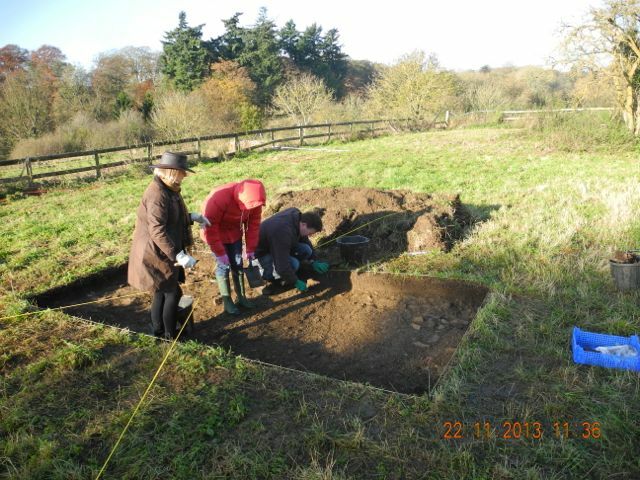 Gazing through an archaeological crystal ball.... a possible reconstruction plan of the gardens around Rectory Farm. So with all this in mind here's another big leap. If the gardens here were laid out by Thomas Bushell it seems likely that he would nave paid some attention to the desiderata set out by his late patron Sir Francis Bacon. In this connection it is interesting read in his essay published 1625, 'Of Gardens' that Bacon favoured a layout with 'the main garden in the middle, besides alleys on both sides' or to elaborate, 'Also I understand, that this square of the garden, should not be the whole breadth of the ground, but to leave, on either side, ground enough for diversity of side alleys, unto which the two covert alleys of the green may deliver you. But there must be no alleys with hedges at either end of this great enclosure: not at the hither end, for letting your prospect upon this fair hedge from the green, nor at the further end, for letting your prospect from the hedge, through the arches upon the heath. ' The latter point seems to describe the situation regarding the walkway and the view to the north. and finally concerning the width of these walks, 'alleys enough for four to walk abreast'. Robin plots and Peter and Brian brave the transit of the fishpond. On the subject of the playful sun we continued to enjoy remarkably fine weather well into November. 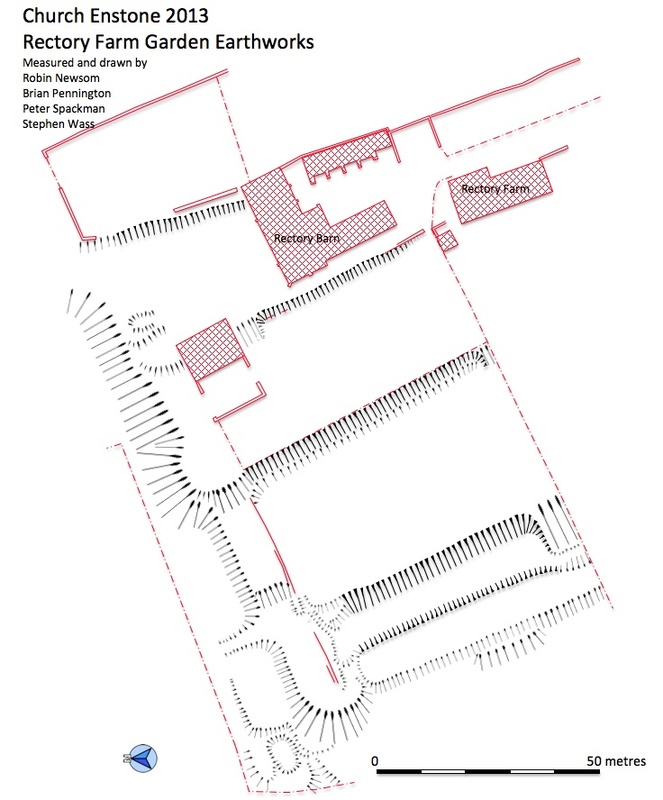 This enabled us to make great strides with the surveying, completing the plan on the stairway, or alley as perhaps we should call it now, and also using the optical level and staff to draw a couple of profiles right across the terraces and down the length of the stairs. A special thanks top Peter, Brian and Robin for this. 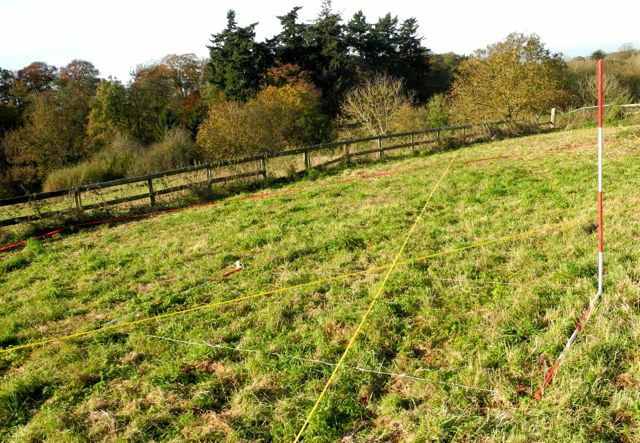 the small area we have open to examine the results of the geophysics is producing some interesting features although as I have been reminded some of them can only be seen with that special 'eye of faith' that all archaeologists are endowed with. Verna directs Sophie and Nick and Nick (again) and Robin (again) start to clear some undergrowth from the sunken feature on the the north west corner of the main garden. 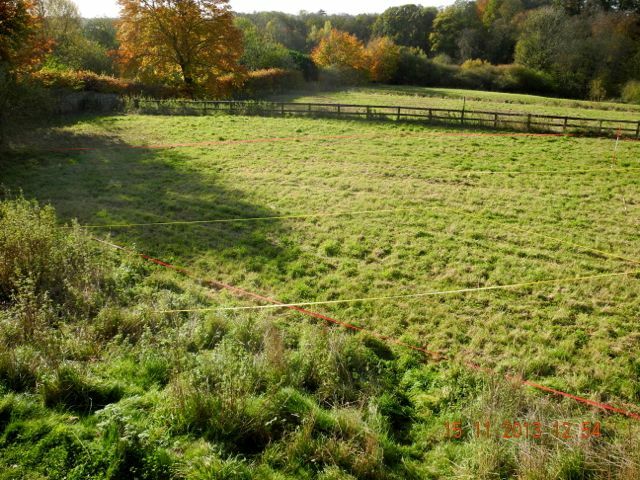 And here is one of the fruits of the massive leveling exercise that Peter organised: a composite view across the entire width of the garden with four terraces and a fishpond/canal. The green line represents, roughly, the natural fall of the land making it easy to see how a process of cut and fill has been used to shape the landscape. 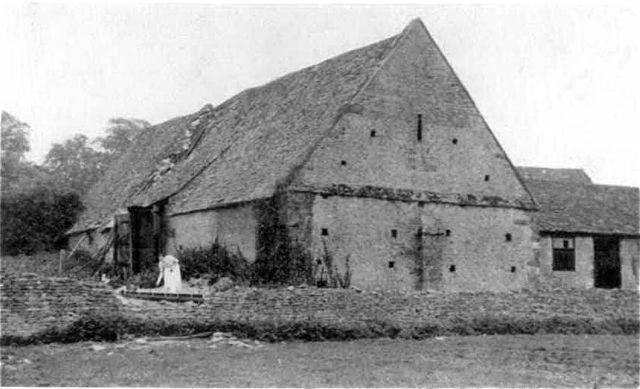 Rectory barn from the west, photo early 20th. century? 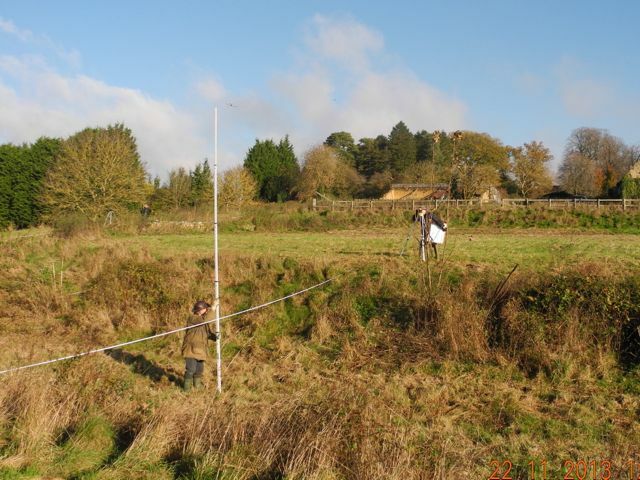 As November drew to a close we set out a metre wide section across the bank on the upper terrace next to the barn. An early photograph (see above) shows the wall to be substantially intact although there seems to have been something of a collapse in front of where the woman is apparently feeding chickens. It's difficult to know what to make of the material which seems to be lying behind this collapse. Given the importance of this wall in defining what may be the boundary between the ornamental and working parts of the garden one might expect it to have had some architectural pretensions, crowned by a balustrade perhaps. Anyway the plan is to clear the collapsed rubble and hopefully recover any early portions of walling and examine how the base of the wall interacts with the original garden surface. 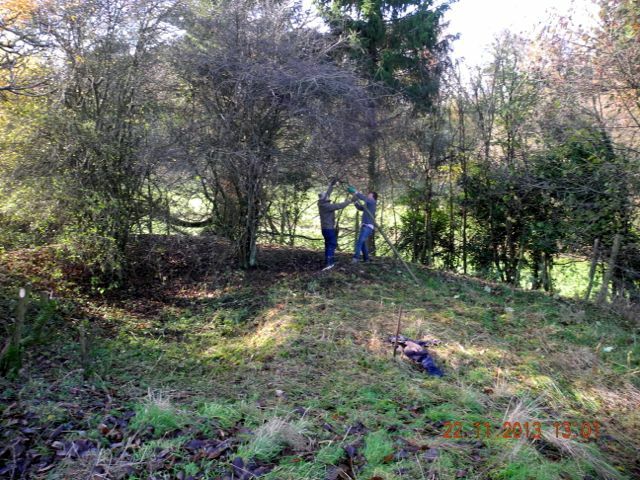 Another task we have just about completed is the earthwork survey with some more clearance of blackthorn down on the north west corner. Robin and I planned the curious little terrace and associated sunken area. It will, of course, take some time to convert these field sketches into a publishable plan but we'll try and get that done before the end of the year. There is clearly something very significant going on here and I've modified the reconstructed plan (above) with the suggestion that this may be the site of a garden pavilion of some kind, a feature which was often to be found marking the corners of formal gardens of this type. Bryan starts to remove the turf from the new section and after a couple of days we can see the extent of the collapsed wall. Meanwhile Robin is plotting down below. 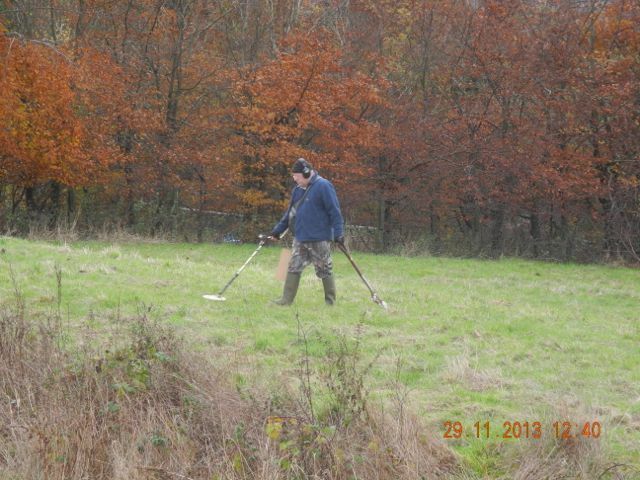 Peter began a metal detector survey of the terraces for us by systematically walking the area and plotting the positions of significant signals. Investigations have yet to turn up anything of great significance but there's more to do. 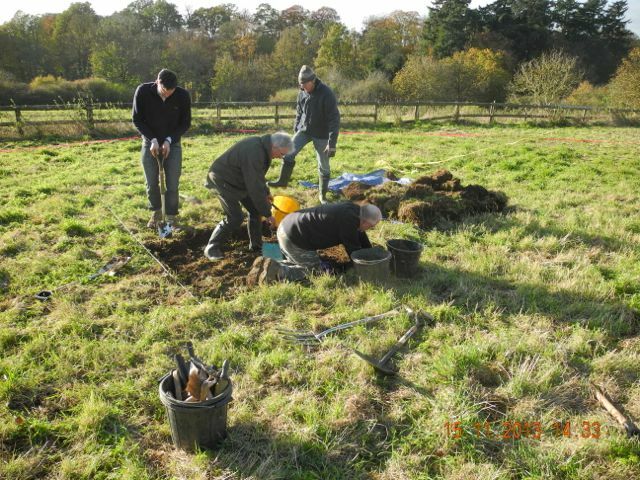 As December will see our attentions concentrated elsewhere we closed the site up until the new year erecting a suitable cover over the main trench where I'm convinced there is a lot more to be discovered given some very careful excavation in January. Peter strides out. All tucked up for Christmas. Now to be honest the next part of the process shaded over into December but who's counting? 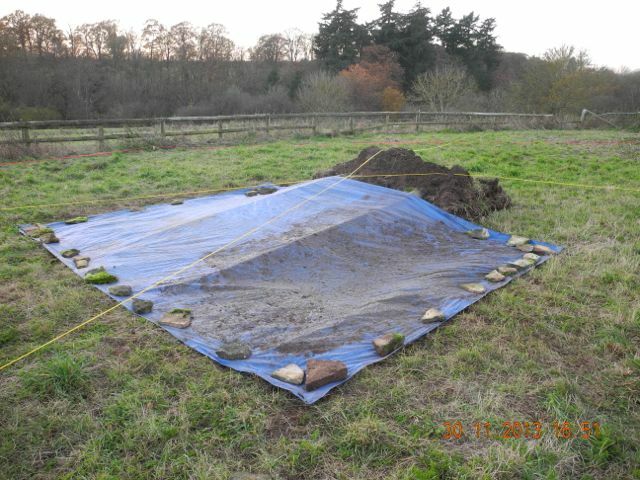 The earthwork survey of Nick's section of garden was drawn out and here it is. This is a reduction of the original drawing so some detail is lost but it is interesting to note the bastion like feature half way down the walkway. Such echoes of the military life were quite common features of gardens from the period. 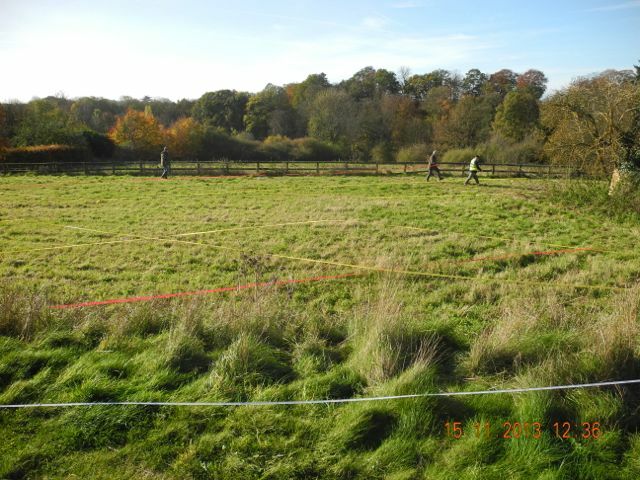 Also visible are the various earthworks on the north-west corner which are clearly part of significant structure. 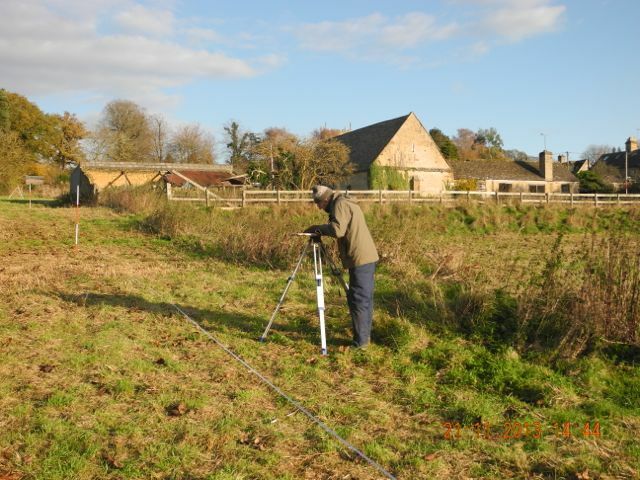 I've also been in correspondence with James Bond who will be known to many of you for his many contributions to work in landscape archaeology in Oxfordshire and elsewhere. He reminded me of the important garden earthworks on the site of Chipping Campden House, a property destroyed during the Civil War but developed during the opening years of the seventeenth century. Although the Campden example is on a larger scale ( the owner, the wonderfully named Sir Baptist Hickes was really very wealthy) stylistically they share many features and clearly belong to a common tradition of design. They are both built as terraced gardens with the accompanying stream broadly speaking to the south. 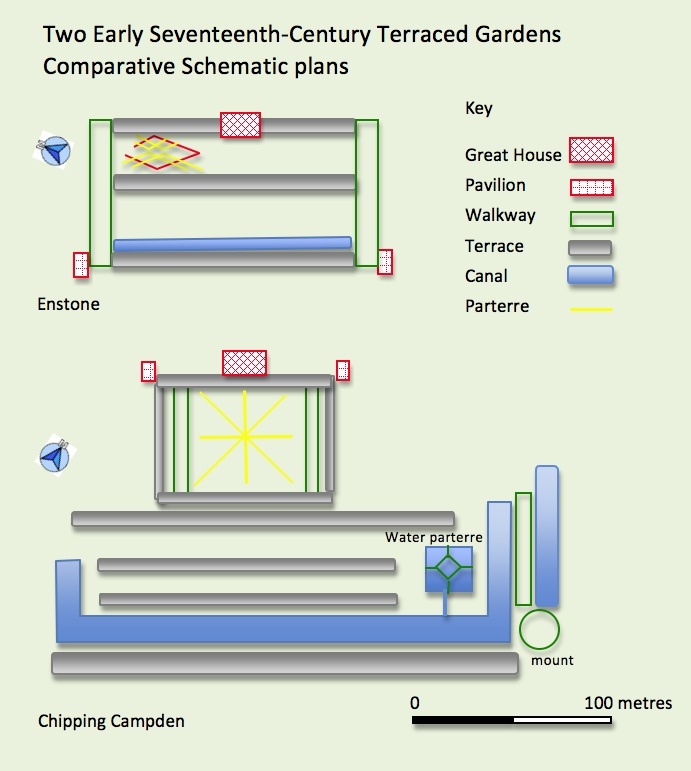 They are strongly symmetric although some irregularity was introduced into the Campden plan with the construction of a water garden, additional canal and mount to the east. Interestingly in early images of the gardens dating from the 18th. century but presumably derived from an earlier illustration the illusion of symmetry is maintained by the addition of a second water feature on the western side. Both gardens feature walkways or viewing terraces as side alleys to the formal gardens and both have terracing which is used to strongly model the natural fall of the ground. The formal parts of the gardens are predictably adjacent to the great houses and other buildings are distributed symmetrically, at least we hope that's the case for Enstone. Finally the lower limit of the garden is defined by a canal. Actually there's another feature I've just noticed, the strong axis through the garden and house also aligns in both cases with the parish church, now I don't normally get terribly excited over alignments, they are too easy to fabricate, but this does feel a touch significant. 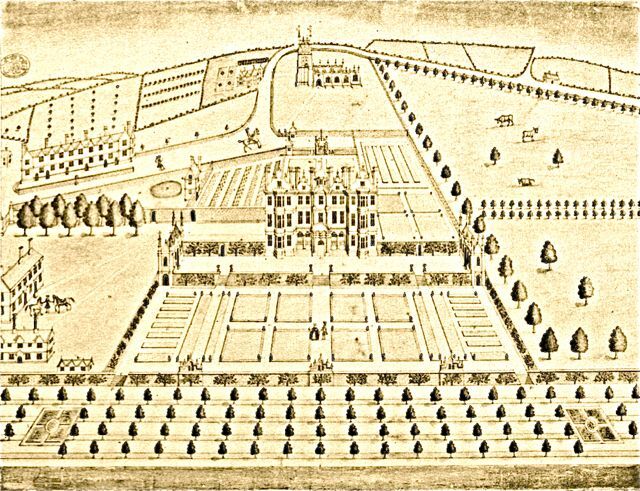 A slightly idealized drawing of Chipping Campden House and gardens from the 1740s, nevertheless an interesting pointer towards the layout at Enstone. Of course we do not know at present who was responsible for the design of the Enstone gardens, whether it was the incumbent Lee family or whether it happened during Bushell's period as leaseholder but one does wonder what if any contacts there may have been between two fairly close neighbours, Chipping Campden is about 16 miles from Enstone.as the crow flies.